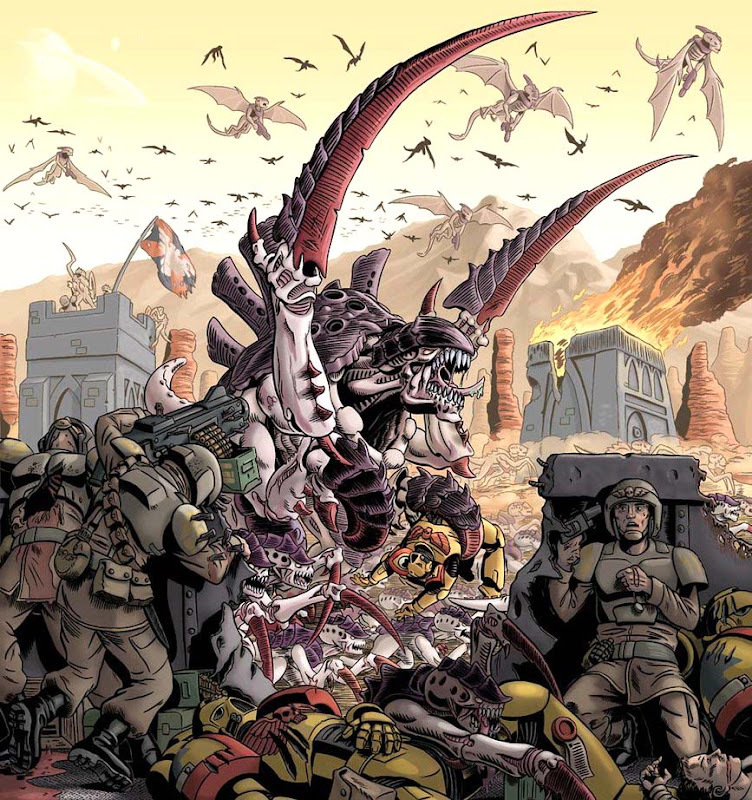 Outside of using profanity or basic inappropriate content, there are only a few things that will get me to skip your post faster than Tyranids can overrun an Imperial Guard gunline. When I started the FTW Blogger Group, I created a post of the 10 things you can do to improve your blog. I figured it would help new Bloggers get started down the right track and get the most from their blog. I suppose you could think of this as an extension to that list. With so many Bloggers posting on a regular basis, you need to capture a readers attention and hold it if you want to keep your head above water these days. We all know posts have a shelf life of approximately .00000001 of a second and then readers have moved on to the newest thing. What are the top three sentences that will make me skip your blog post as soon as I see them? I see this one all the time. You can fill in the rest of it afterwards. I built this model, I painted that model, I tried this out, etc. With so many people producing high quality stuff and killing themselves to post on a regular basis with good pics and info, why would I stop and look at what someone did while they were bored the other night? If you only had a few minutes to catch up on the 40k blogosphere and could only read one post, which one would you choose? Again another one where you can fill in the rest of the sentence. I'd say to get some sleep and then come back to your blog before hitting the publish button. With a quick nap, you might think twice about what you're going to publish on your site. Unless you're crunched for time due to some kind of contest and you absolutely must post something (which makes me wonder why you just don't just keep working if you're that pressed for time), then go ahead and do it. Otherwise come back when you're rested. Listen, we all have real lives outside the hobby. It's ok to have a life outside the hobby folks. When I see this one, I know it's nothing more than an apology for doing other stuff. I don't need the apology for you doing more important things in your own life. This is just a hobby. I know I can find this at the start of a post that ends about a sentence later with "I promise to post something soon." Skip posting this and just come back when you have something you want to share. I won't be mad, believe me, I'll still be here and I'll be more likely to look at what you have when you do come back to posting. So there you have it, the three things that will drive me (and I'd be willing to bet most folks) away from you post and blog quicker than you can delete it and put something else up in place of it. But what should I post about? NOTE: I'd like to thank everyone who has taken a minute to express their feelings on this. Even those who do not agree with me. It's nice to get both sides of the discussion going. Make sure to look through the comments and see what some folks have said. Good list. I'm guilty of at least one of these at some point over the last two years since my blog started. Number 3 springs to mind! I feel some responsibility towards my readers and when I miss a deadline I certainly feel obliged to apologise. It's just my way of saying I'm not taking my readers for granted. But I getb your point entirely. If all I have is an apology it can wait until I have something else to post along with it. Sorry not left a comment for a while, but I was bored and couldn't sleep so thought I would. All joking a side great blog, thanks for taking the time to entertain us keep up the good work! Good tips and I'm sure I've been guilty of at least one of these in the past. However, I'm trying to start over with blogging about mini's, so this is good advice on how not to mess up and create something engaging. Which is what I'll try to do. Can't promise I'll succeed, but I'll try. I know, I was bored too and so I posted this. I knew I'd get a handful of "apologies" in the comments with this post. On the matter of Count 3, guilty as charged. As Biglee has said, I get a big guilt trip when I haven't posted in a while, which has been the case over the past few months. But you're absolutely right Ron, there are other things in life and we shouldn't feel obligated to explain ourselves ad nauseam. Better to return fresh with something new to shout about. While I've probably done number 3 at least once, I'm denying it until faced with evidence! It's not just the Brits, I'm sorry that you're sorry and I'm from the US. #3 bothers me as well... A lot in fact. I made myself a promise a long time ago that I would never make one of those posts. I'd sooner (and have already) allow my blog to go stagnant before posting poor content. I do my best conversions as a bored, sleep-deprived, hobby-hermit. If I get bored and I haven't slept in days it will make some people's heads explode. Good post. I, too, will point out that #3 can be a courtesy to readers. But, usually the title is enough. No reason to go to use multiple paragraphs to explain why you have not posted. A simple sentence or two is enough. Also, we should not post again until we have something of substance to post. Great post, it's a good read when you can't sleep or you're bored and you're sorry for not posting lately. Just kidding. It's really good advice. Sometimes our own psyches play against us through these overused phrases. Ricalope: If that's the way you work best, then that's perfectly fine and you shouldn't apologize for it. As people see and know your work, they'll come to learn that's how you operate best. I'm sticking to it though, these three things will turn more folks away than they will draw readers into your blog. This is why I gave up making promises or predictions about what I would do next - because I would end up not doing it, then apologising for it. Hi, Great Blog, I am a true fan, Totally cool minis and paint jobs and info, BUT I don't agree with this elitist post at all. Or any sycophantically cool agreements. Truly sorry for any offense. Not. Blog is short for a combination of biography & log. A real blog is reality about reality however lame otherwise. Its for geeks, purists can join in BUT not make the rules. I can see where you are coming from, but your information is skewed. Blog comes from the words Web and Log, it's a weblog. Artificer: Thanks for the different viewpoint. I think the idea here is more to show people what works and what doesn't when it comes to blogging and building your site. I'm not so much addressing the exact content as how it's presented. As with most blogging worlds (ours being 40k), I'd guess that the rate of new material coming out each day is high and posts don't stay on readers must read lists very long before being replaced with newer stuff. Regardless of what topic you're discussing, there are ways to present your stuff in order to capture and keep your readers attention (and keep them coming back) and there are ways to present it that are going to work against what you're trying to do. To me, it's about how you share your material and has nothing to do with purist, elitist, geek or not. Surely a blog is not simply a record, it includes the presentation of experience. There's nowt intrinsically wrong with honest words, but if they stop the reader cold, then is one fulfilling one's role as a blogger? This sort of thing is part advertisement, as Ron says. If you think its duty is just to present a true record, then even in that situation you should consider "what is truth?" If I can make something sound better with juxtaposed symbols or onomatopoeia, so much the better! (If I could spell it without having to pause and think, I'd be even happier!) I don't mean one should falsify stuff, but polishing a phrase ain't no crime. Guilty and innocent at the same time for saying sorry. Guilty because i've done it one or two times and innocent because I think we must say our readers we don't forget them. And sorry again for my english. Ohh Sorry I can't say sorry hehe.. It sounds like your handing out rules for how people should express themselves. In the comments of this post, there are actually people admitting they are "Guilty...for saying sorry." I refuse to believe that is what you wanted to see result from your article. However, I do think your heart is in the right place. Maybe we could support people for making the effort to express themselves, not admonish them because they haven't found the proper words. Pete: I would say that it's a good bit presentation. Even things like the color of your text against your background color. If it's hard to read (dark text on a dark background) it's one of those things that may turn off potential visitors. If the color of your links is the exact same as your text, it may be near impossible for readers to find them and follow them. You can't go around wondering why readers don't click on your links if they can't find them. Same goes for pictures, why post blurry pics? Col: They're not rules by any stretch and I think the folks saying "sorry" are more likely doing it tongue in cheek. I do support peoples effort to express themselves, but if you're looking to capture your readers attention in this fast paced blogging world we've created, I think these kinds of things (and other aspects like I mentioned to Pete) go against that in a huge way. If you're looking for feedback, comments, reader interaction, isn't it in your best interest to not post things that appear as those you're just killing time, don't know what else to post or have no real content to share? Would you spend your valuable time checking out something that someone else just threw up there because they were "bored" or "hadn't slept?" They may seem like rules or guidelines, but readers are only going to give you a fraction of their time... if you don't put your best foot forward (regardless of the material) you'll be overshadowed by those who do. I think that's one of the beauties of the blogging world, the work involved... it's much more than just dumping something on a forum. To me, these kinds of sentences are indicators to skip a post as opposed to a nice picture or a good headline that grabs my attention... no matter how long ago it was when they last posted. While I agree it doesn't make for interesting reading, I think it is acceptable because, on some level, we have all been in that situation and felt a certain responsibility to people who subscribe. Still, I respect your opinion and certainly defend your right to express it. Col: I appreciate your willingness to speak up despite being the minority opinion of those who commented. Maybe a better title would have been along the lines of "not the most interesting posts..."
lol...you're a good man, Ron Saikowski. Good stuff Ron, I for one have definitely been guilty of the last one. What can I say real life comes up quite regularly and the first thing to suffer is hobby time. And when you come back you notice all those other, much better posters and hobbyist out there having been busy as well but still pumping out the goodies. I'm not looking at stuff as a competition, but it can be daunting when you see how good some people and their blogs are. So, at least in part, I think that the 'sorry to have been away for so long'-comment is something we say both to the people who frequent our blogs and ourselves. Having been one of those folks who posted an "Apology Post" once upon a time, I couldn't agree more. I'm 34, have a wife and a 3 year old along with a more-than full-time job... I read what I can, when I can. And now that I'm making more of an effort in my own hobby blog, I relish those who post their meat and potatoes more than not.